With tax season winding down, it’s time to start thinking about what to do with your refund from Uncle Sam. The reality is that many homeowners in Hudson will put that extra money toward a vacation or extravagant purchase (such as a new car). But what if you want to do something a little more financially responsible with your tax refund? Sure, you could put every last penny into your savings account and be done with it. Another option might be using your refund to make a dent in your credit card balance. Here at St. Croix Cabinet Solutions, we recommend putting this additional income back into your biggest investment — your home. Here at St. Croix Cabinet Solutions, we understand the cost concerns that often arise with cabinet replacement. Rest assured, though, that our team does everything in our power to save you money without sacrificing quality. As a locally owned and operated business that partners with some of the best kitchen contractors in Hudson, we have options for every budget. It’s our belief that money shouldn’t get in the way of your dream cabinets. It could be that you like your cabinets overall but are ready for a different style and/or color. In this case, cabinet refacing is a route worth taking. For those who aren’t familiar with the process, cabinet refacing involves removing the existing doors, drawer faces, or complete drawers and installing brand new ones. At St. Croix Cabinet Solutions, we make cabinet refacing simple and stress-free for the homeowner. Take your pick from an extensive selection of wood varieties, wood and style combinations, stain colors, paint colors, accessories, and more. Keep in mind that cabinet refacing is also a sensible option if your cabinets are damaged, faded, or yellowed. New countertops are the perfect complement to your newly updated cabinets. But how do you know which local kitchen contractor to hire for the job? At St. Croix Cabinet Solutions, we invite you to choose from a number of material offerings, including quartz, granite, marble, travertine, high-pressure laminates, and more. Part of what makes our kitchen remodeling contractors different is that we never pressure customers into products or services they don’t really need. So when it comes to kitchen countertops, we will tailor to your specific design, color, and budget preferences. You can count on St. Croix Cabinet Solutions to remain transparent throughout the process. As you can see, teaming with St. Croix Cabinet Solutions is a sound investment of your tax refund. We guarantee you will not only appreciate our level of craftsmanship but our emphasis on customer satisfaction as well. This means telling you upfront the amount of time we need to get the information to help you with your project. From there, it’s all about communicating clearly, paying attention to the details, and responding promptly. 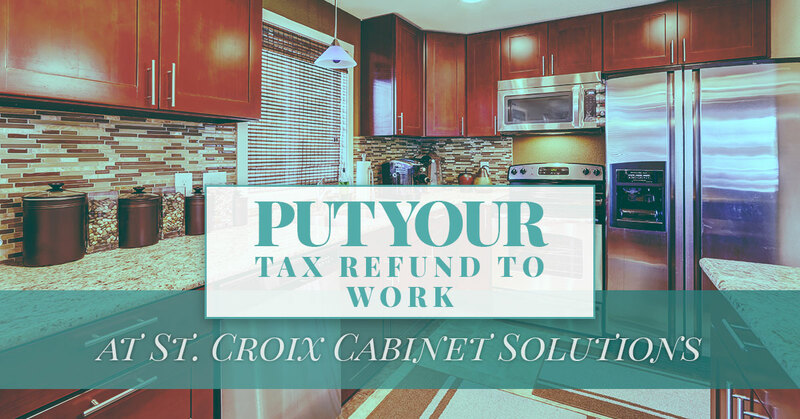 This spring, put your tax refund to work at St. Croix Cabinet Solutions. Learn more about our designer kitchen services in Hudson today.